What is continuous glucose monitoring? What are the prospects for an artificial pancreas? Glucose monitoring helps people with diabetes manage the disease and avoid its associated problems. A person can use the results of glucose monitoring to make decisions about food, physical activity, and medications. 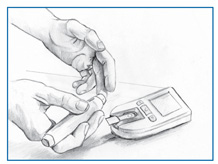 The most common way to check glucose levels involves pricking a fingertip with an automatic lancing device to obtain a blood sample and then using a glucose meter to measure the blood sample's glucose level. People with diabetes typically use a lancing device to obtain a blood sample and a glucose meter to measure the glucose level in the sample. Many types of glucose meters are available, and all are accurate and reliable if used properly. See the American Diabetes Association's annual resource guide at www.forecast.diabetes.org/2011-meters-chart for more information. Some meters use a blood sample from a less sensitive area than the fingertip, such as the upper arm, forearm, or thigh.